The monochord, called “Dan Bau” in Vietnamese language, is one of the only two traditional musical instruments of purely Vietnamese origin. “The music of the Dan Bau should be solely for the pleasure of its player. 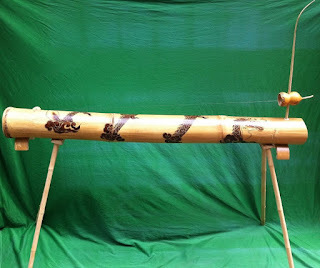 Like almost all of Vietnamese traditional musical instruments, there is not enough reliable documentation to determine the age and the inventor of the Dan Bau. 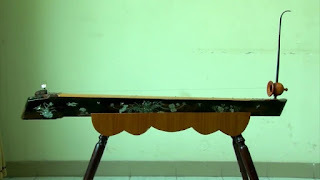 According to the “Dai Nam thuc luc tien bien”, a history book of Vietnamese composed by Nguyen dynasty in the 18th century, the first Dan Bau was made in 1770. However, nowadays, many scholars estimate its age to be up to one thousand years older than that. A popular legend of the Dan Bau’s beginning tells of a blind woman playing sorrowful music from the instrument in the market to earn money for her family while her husband was at war. She received this instrument as a special gift from a fairy, who was very touched by her behavior of sacrificing her eyes to save her mother-in-law’s life. 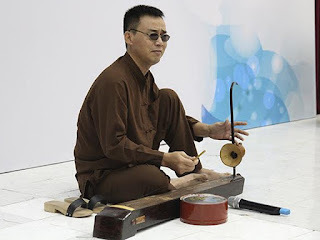 According to Professor Tran Van Khe, a well-known scholar of Vietnamese traditional music, addressed in a workshop of Dan Bau in Bulgary in 1998, and then was quoted on Vietnam Beauty website, “whether this legend is based in fact or not, it remains true that the Dan Bau has historically been played by blind musicians. At its first appearance, it was a very simple instrument comprised of a bamboo section, a flexible rod, a calabash or half a coconut. The word “monochord” means one-string. In Vietnamese, Dan means a stringed instrument, and Bau means gourd. The appearance of the Dan Bau looks like exactly what it says. According to Wikipedia, originally, the Dan Bau was made of just 4 parts: a bamboo tube, a wooden rod, a coconut shell half, and a silk string. The string was strung across the bamboo, tied on one end to the rod, which is perpendicularly attached to the bamboo. The coconut shell was attached to the rod, serving as a resonator. 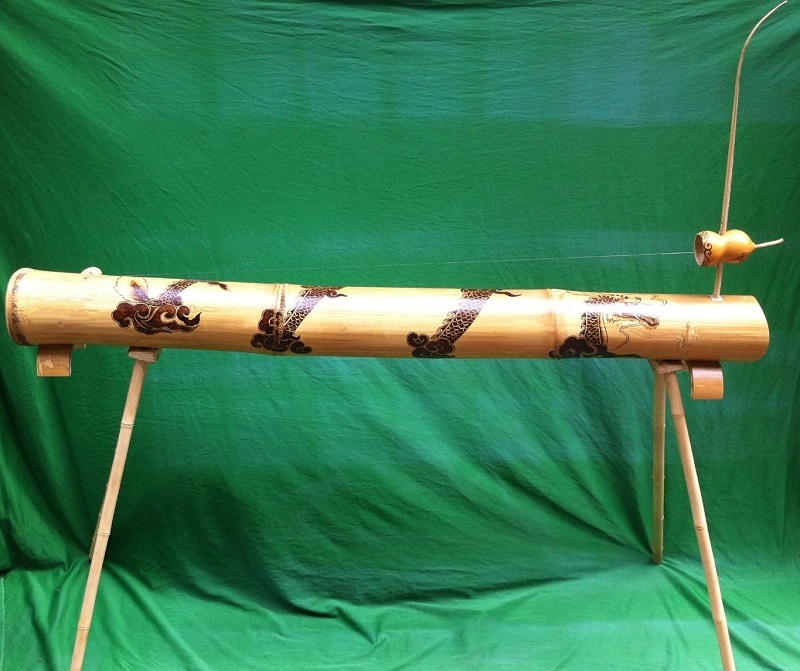 Now, the bamboo has been replaced by a wooden soundboard, with hardwood as the sides and softwood as the middle. An electric guitar string has replaced the traditional silk string. While the gourd is still present, it is now generally made of wood, acting only as a decorative feature. Also, most Dan Bau now have modern tuning machines, so the base pitch of the string can be adjusted. Usually the instrument is tuned to one octave below middle C, about 130.813 Hz, but it can be tuned to other notes to make it easier to play in keys distant from C.
In recent years, Dan Bau is made very carefully to ensure aesthetic and sound quality. When played in public, it is often used with an electronic amplifier. Although having only one string and simple structure, the Dan Bau is not easy to play well. Playing the Dan Bau requires high precision to allow rise and fall of pitch along with lengthening and shortening of the notes with the aid of the flexible rod that permits the shifting tension of the string, thus, trills could be played. When playing the Dan Bau, the musician uses a long plectrum to pluck the strings by his right hand while touching it lightly with the side of the hand at a point producing a harmony. At the same time, the player uses his left hand to push the flexible rod towards the instrument using the index finger to lower the pitch of the note, or to pull the rod away from the instrument with the thumb to raise the pitch of the note. This technique is used both to play notes not available at a node as well as to add vibrato to any note. The Dan Bau may be played on a scale consisting of third-tones or even quarter-tones. The notes played by the Dan Bau are smooth, sweet, and captivating. In the past, the Dan Bau was usually played solo or along with poetry recitals. In recent years, it has taken part in large orchestra to accompany stage operas. Now the Dan Bau has been usually performed in big events of Viet Nam and on major stages in foreign countries. 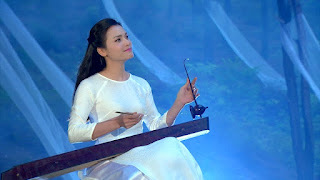 With soft and charming sounds, the Dan Bau was used only to perform Vietnamese ancient traditional music, such as “Cheo,” a traditional operatic genre for many folk stories in North Viet Nam; Hue’s music, a combination of popular local music and royal chamber music from Central Viet Nam; “Tai tu Nam Bo,” the royal chamber music in South Viet Nam. However, in the past 50 years, the music of the Dan Bau has taken a huge turn where players infused electrical pickups and amplifiers with the instrument to make its sound more distinct and audible to larger audiences. 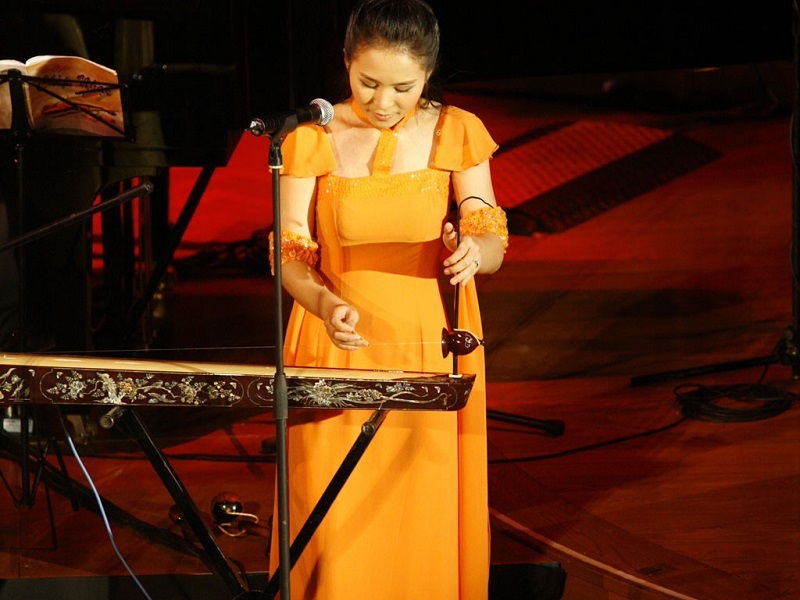 In addition, traditional musicians not only play the older inherited repertoire but also new compositions, creating new performance techniques for this instrument. Now, there are many modern musical pieces exclusively composed for the Dan Bau solo, such as Truong Chi’s smoke by composer Nguyen Thien Dao, Dance of the Central Highland by Duc Nhuan, For the South by Huy Thuc, and so on. Watch the Dan Bau performance of artist Ngo Tra Mi with the “Truong Chi’s Smoke” song.